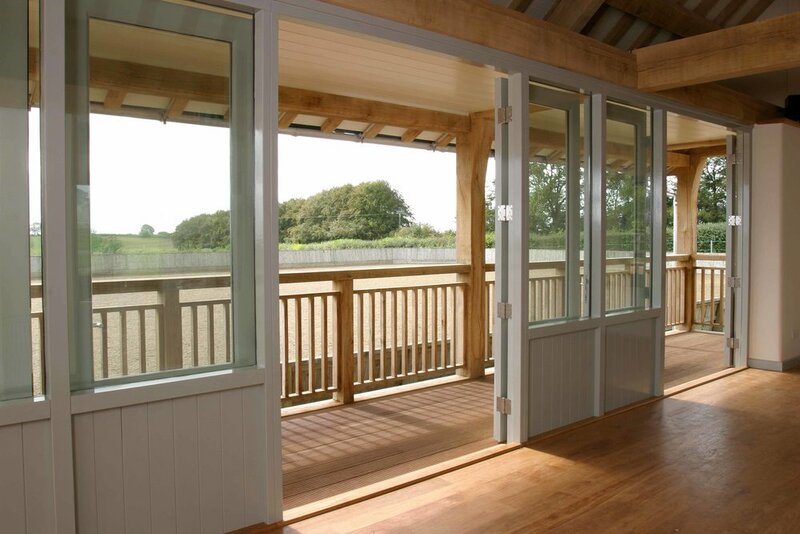 A new build oak framed Polo clubhouse with balcony and terrace areas used to host polo matches and entertainment events. The building is sited adjacent to an all-weather pitch (arena) providing spectators with bar facilities, meeting space and vantage point to enjoy the spectacle of polo matches. Andrew Kenyon Architects' design combines natural materials, local craftsmanship and familiar forms to create a flexible contemporary building with a warm and friendly quality. The pitched roof is highly insulated and covered with natural slates. The structural frame is traditionally built in oak, external walls are insulated to a high standard and finished in local natural coursed rubble stone and timber boarding. To provide unobstructed views across the polo pitch the building is raised on oak posts above the arena perimeter fence. Glazed timber doors open out onto the balcony and overlook the arena to provide panoramic views of the sporting action along with high levels of daylighting to the interior. The overhanging roof provides shelter to the balcony, reduces glare from the southerly sun angles and prevents excessive solar gain and overheating inside the clubroom. Increased spectator numbers have resulted in the phased extension of the balconies and the construction of a terrace. The terrace, measuring 26 x 13 metres, provides additional space for large events and functions in the summer. Natural stone has been used throughout with York stone paving and local limestone to the low enclosing walls to match the clubhouse. An oak framed gazebo provides a focal point to the terrace with additional servery location during functions.